What are the most healthy frozen meals? Here are some of the best frozen meals to lose weight that are affordably-priced and widely available in supermarkets (ratings provided by iLoveThisDiet.com, The Supermarket Frozen Meal Diet Plan). 25 Great Frozen Meals for Losing Weight! These frozen entrees combine great taste, nutrition, and they're filling too! If you're trying to lose some weight, you may have considered Nutrisystem, or Jenny Craig. For those of you who'd rather save a ton of cash, you can lose weight using frozen meals from your supermarket. But you've got to choose the right frozen meals to jettison those pounds without feeling hungry or becoming nutritionally deficient. And you'll have to add fruits, vegetables, and dairy (or dairy substitutes), just as Nutrisystem and Jenny Craig require their members to do). Want to know more about which frozen meals to eat to lose weight? Listed below are the Top Ten frozen meals for each brand, rated for taste, nutrition, and how well they'll keep you from getting hungry. Brands are in alphabetical order. Taste Rating; higher is better. 10 is best. Nutritional grades weigh multiple factors, including sodium, fiber, saturated fat, and sugar content. An asterisk * by the meal indicates it contains 1/2 serving of non-starchy vegetables. "Eating Right for Healthy Living" is an in-house brand of the massive supermarket chain Albertsons Companies, which includes: Safeway, Vons, Pavilions, Randalls, Tom Thumb, Carrs, Albertsons, ACME, Jewel-Osco, Lucky, Shaw’s, Star Market, and United Supermarkets. Nutritional grades. Also, an asterisk * by the meal means that it contains 1/2 serving of non-starchy vegetables. trending article: A Dietitian Shows You How to Lose Weight Using Frozen Meals from Your Supermarket. Due to the limited number of Kashi single serving frozen entrees available, we are including only the top 2 Kashi meals in each category. Nutritional grades. Also, an asterisk * by the meal means that it contains 1/2 serving of non-starchy vegetables. Two asterisks means a full serving. UPDATE: TARGET HAS DISCONTINUED "SIMPLY BALANCED" FROZEN MEALS. 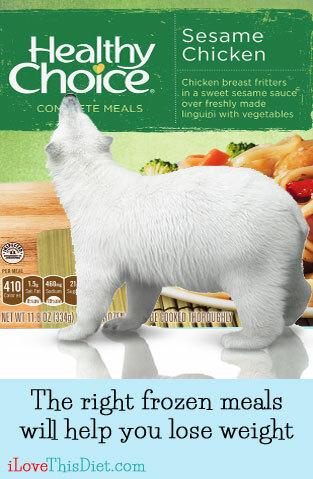 Due to the limited number of Simply Balanced single serving frozen entrees available, we are including only the top 2 Simply Balanced meals in each category.